The site of the present church was purchased in 1912 and a church / school erected to the designs of North & Williams erected in 1915. This building envisaged a central tower but only the nave was completed. 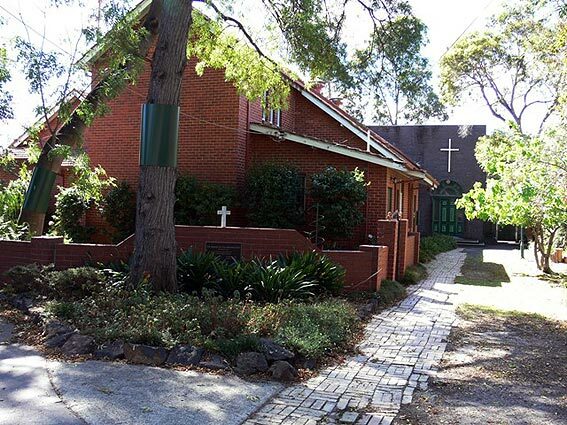 Extensive additions at the front of the church and a long sanctuary and lady chapel were added in the 1970s. 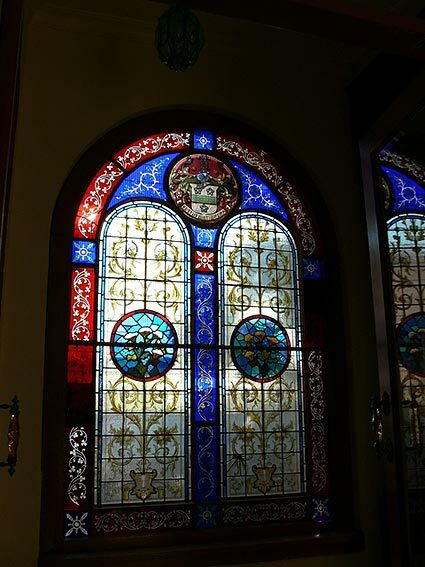 Components from demolished Melbourne mansions, such as cast iron columns, stained glass and ceramic paving, were utilized. 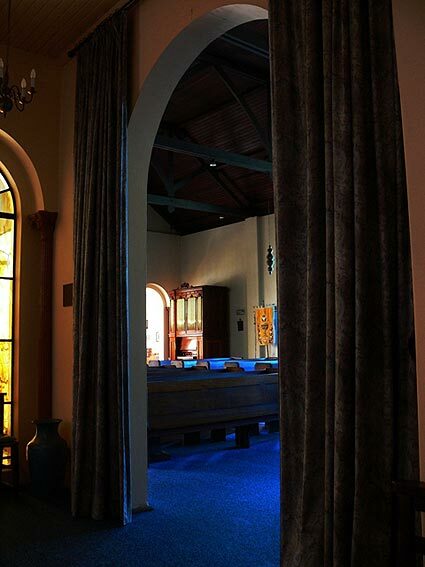 The sanctuary entrance is marked by a suspended rood beam while the high altar is surmounted by a ciborium. There is some excellent stained glass in the lady chapel and sanctuary. 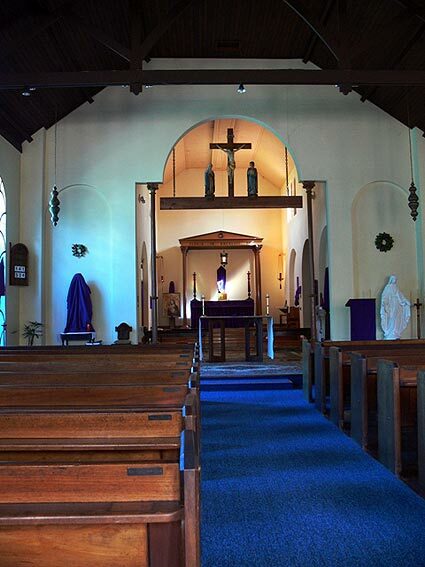 The church has had a strong Anglo-Catholic tradition from the outset. The first pipe organ in the church was built by John Smith, of Bristol, and came from St Matthew’s Anglican Church, Cheltenham in the early 1960s following alterations by Davis & Laurie. 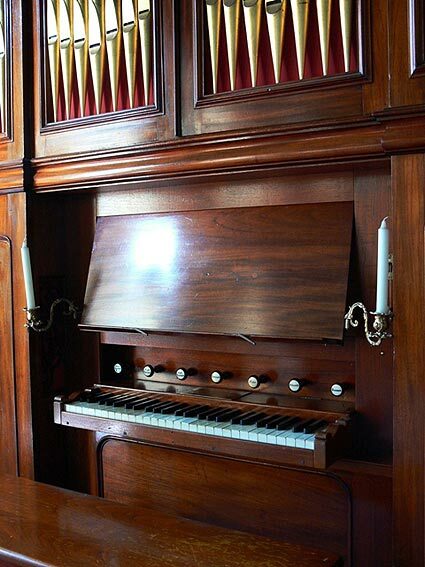 This was one of a handful of organs sent from the Bristol firm to Melbourne, other instruments including the Athenaeum Hall, Collins Street, St Paul’s Anglican Church and St Peter’s Anglican Church, Eastern Hill. 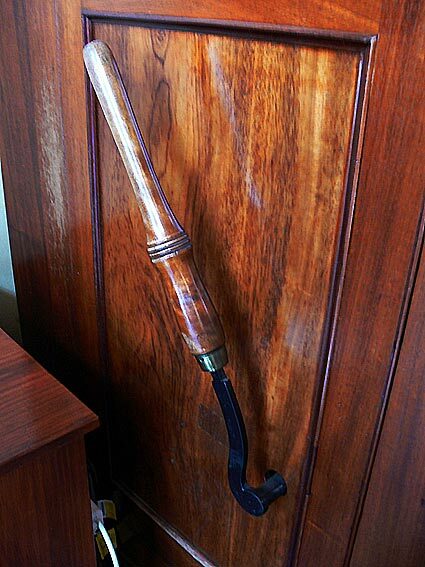 This instrument was sold to St John’s Anglican Church, Bega, NSW in 1988. The present pipe organ was built by Samuel Joscelyne, Launceston, Tasmania for his home in York Street, probably in the mid-1860s. It was sold in 1924 to Burnie Baptist Church, Tasmania and remained intact until circa 1973 when an ill-advised electrification took place. 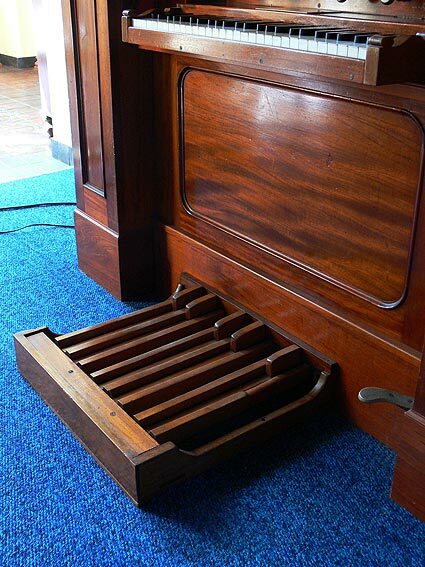 This was unsuccessful, so the parts were purchased by Melbourne organbuilder Steve Laurie when he built a new pipe organ for the church in 1980. The parts of the organ that remained were purchased from Steve Laurie by John Maidment who engaged the S.J. Laurie firm to reconstruct the instrument as close as possible to the original. It was initially installed at ‘Glen Morag’, 10 Wattle Valley Road, Canterbury, 1982-1987 and was installed at St James’ Church in 1988. A recycled double-rise reservoir, feeders and hand blowing facilities were provided, a new deal building frame and swell box constructed, a new windchest was made for the bottom pipes of the Stopped Diapason 16, and new key and stop action levers in myrtle constructed. The base of the casework, which had been cut around to provide a new console, was reconstructed in cedar. A new bench was made in cedar, this being a close match to that on the 1862 Joscelyne organ at St Michael’s Anglican Church, Bothwell, Tasmania. The whole of the excellent pipework survived - all the metal pipework is of high grade spotted metal possibly supplied by Edward Violette, London, whose stamped inscription appears on the original keyboard (this has rounded ebony sharps). 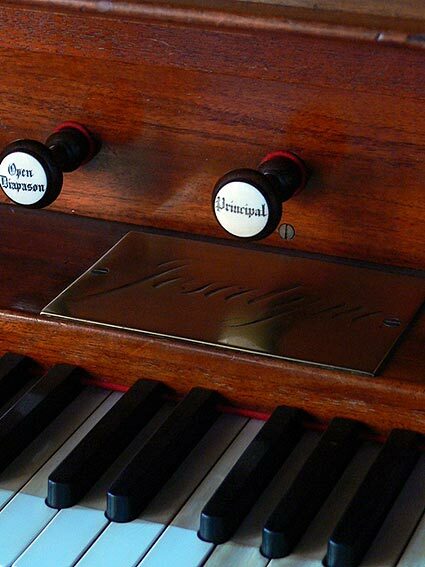 The front slide on the six-rank slider chest was originally provided for a reed (Oboe) but a Keraulophon had later been placed there. 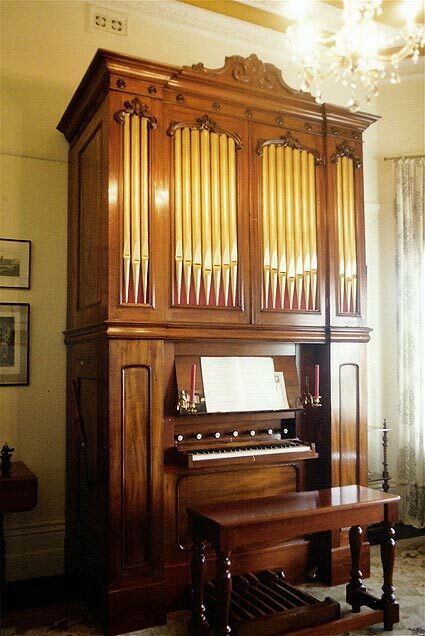 The Keraulophon was discarded (it is now the Solo Gamba 8 on the Kenneth Jones & Associates organ at Trinity College, Parkville) and replaced by Bassoon 8, from tenor C. These pipes are by Fincham & Hobday and came from the Solo Organ added in 1886 to the Hill & Son organ at Adelaide Town Hall. The instrument is of interest for its superlative casework in Australian cedar (Toona Australis) and its outstanding craftsmanship. The casework is one of the largest surviving examples of 19th century Australian furniture and is notable for the excellence of its design; it has a splendid cornice, decorated with carved paterae, carved central cresting with scroll motifs in contrary motion, raised case panels and four flats containing dummy wooden ‘flatback’ pipes covered in gold leaf and backed in red silk; the centre of each opening is surmounted by a carved curving rococo-style motif. The sides of the console opening have fretted inset panels while the large brass nameplate simply has “Joscelyne’ engraved in copperplate script. Joscelyne’s work in England thus covered three periods of furniture design: Regency, William IV and Victorian. It is not known whether Joscelyne made organs at this time; maybe he did so for his Independent brethren, or perhaps for his home? However, it seems certain that he must have been fully conversant with their principles of construction and conventions of case design. Joscelyne played a vital role in the Launceston community. He was a committee member of the Launceston Mechanics Institute (where the Charles Brindley organ in the Albert Hall was initially housed), an organist, and also a performer on the viola, violoncello and double bass,  for which his talents were frequently in demand. Samule Joscelyne died on 20 June 1877, aged 75, from congestion of the liver. His son, C.W. Joscelyne, became the Launceston agent for George Fincham, the Melbourne organbuilder, and undertook minor work on his behalf. Samuel Joscelyne’s grandson Stan Joscelyne ran a music shop in Launceston for many years and was a music critic in that city before his death in the 1970s. A number of descendants survive in Victoria and Tasmania. In the 1850s and 1860s Samuel Joscelyne built at least three pipe organs, making most of the wooden pipes, parts and casework himself, but obtaining the keyboards and metal pipes from England. The internal woodwork, and especially the cedar casework, of his instruments is of superlative quality and testifies to his skill as a furniture designer and cabinet-maker. 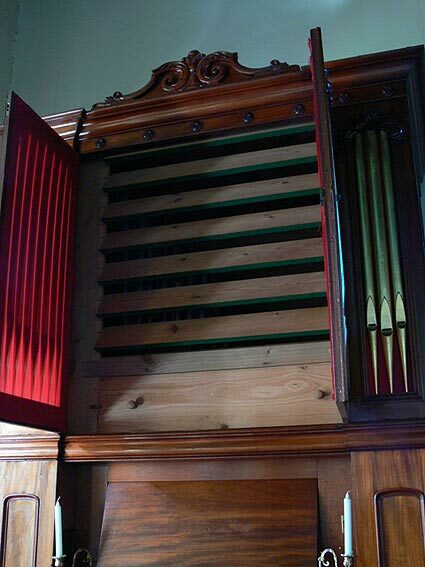 Joscelyne’s earliest Tasmanian organ was a small single-manual tracker action instrument built for his own home. This was later lent to A.W. Biggs, of Scottsdale, and has subsequently been broken up. 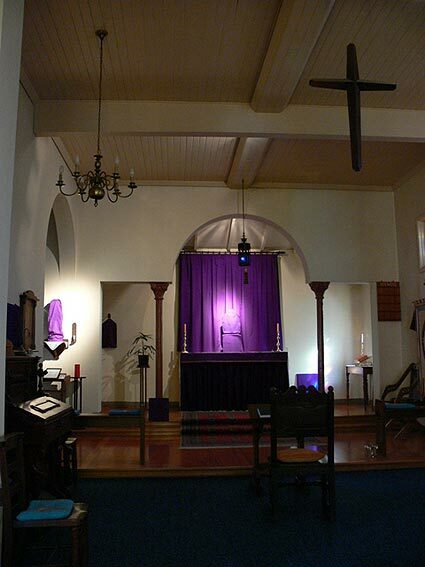 His second organ is thought to be the instrument in St Michael’s Anglican Church, Bothwell, which bears the date 1862. His third organ was again built for his home, in York Street, Launceston, but its precise date of construction has not been found. This instrument remained in the Joscelyne home for many years after Samuel’s death and continued to give great aural and visual pleasure. 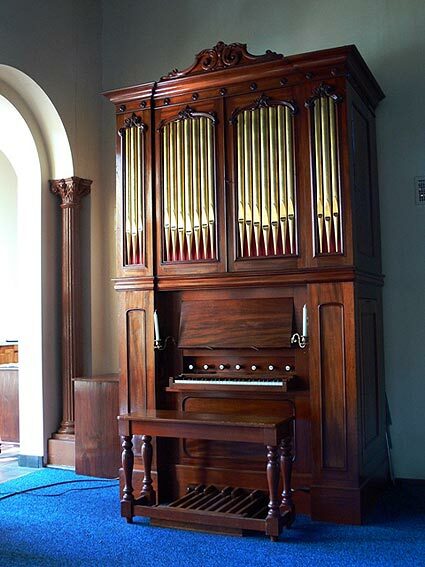 At least one further Tasmanian organ – now at St Luke’s Anglican Church in Latrobe – may have been built by Joscelyne, but there is no documentary evidence to support this claim; the casework of this instrument, while splendidly designed, has been constructed in pine. The Bothwell organ was initially placed in an earlier church in that town used jointly by the Anglican and Presbyterian congregations. It was moved into St Michael’s Church, designed by Alexander North, in 1891. The organ was restored in 1967 by Keith Davis & Son, Launceston. Its casework is based upon a typical 18th century motif of three towers with two intervening flats of harp shape. The detailing, however, is distinctively Victorian, notably the mouldings, cornices and corbels. Few Australian-built organs can equal Joscelyne’s instruments for their sheer visual appeal. It would be fascinating indeed to inspect examples of Joscelyne’s furniture which would doubtless exhibit a level of design and execution comparable with his organs. However, it would be very difficult to identify specimens as very few cabinet-makers signed their work. So it is to the two organs, at Bothwell and East St Kilda, that one must turn to appreciate Joscelyne’s skill. These instruments would rate among the largest and finest examples of Australian colonial cabinet-work and, as such, are of considerable importance in the history of Australian craftsmanship. Samuel Joscelyne’s work is also discussed in the important work on Australian furniture: Kevin Fahy, Christina Simpson, Andrew Simpson, Nineteenth Century Australian Furniture, Sydney, NSW: David Ell Press, 1985, pp. 133-134, 138, 260. This article was first published in OHTA News, volume 7 no 4, October 1983, pp.24-26 and has received minor changes.